Strengths Based Parenting doesn’t prescribe one “right” way to parent. Instead, author Mary Reckmeyer empowers parents to embrace their individual parenting style by discovering and developing their own — and their children’s — talents and strengths. With real-life stories, practical advice backed by Gallup data, and access to the Clifton StrengthsFinder and Clifton Youth StrengthsExplorer assessments, Strengths Based Parenting builds the foundation for positive parenting. 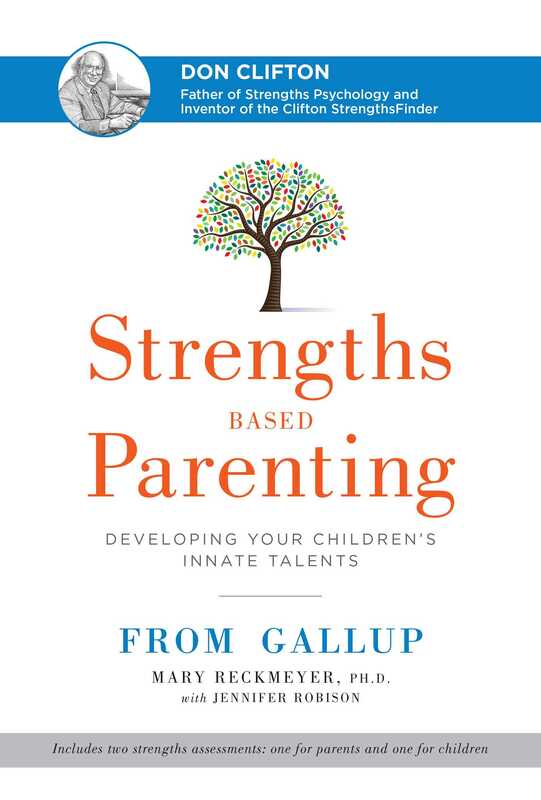 Strengths Based Parenting is grounded in decades of Gallup research on strengths psychology — including assessments of nearly 1 million young people — and highlighted in Gallup’s national bestseller StrengthsFinder 2.0. More than 14 million people have taken the Clifton StrengthsFinder assessment to discover their unique combination of talents and strengths. Gallup knows that focusing on talents and strengths can improve the quality of people’s lives. Now, in Strengths Based Parenting, Gallup extends strengths psychology to the most important operating system in the world — the family. How can you discover your children’s unique talents? And how can you use your own talents and strengths to be the most effective and supportive parent possible? Strengths Based Parenting addresses these and other questions on parents’ minds. But unlike many parenting books, Strengths Based Parenting focuses on identifying and understanding what your children are naturally good at and where they thrive — not on their weaknesses. The book also helps you uncover your own innate talents and effectively apply them to your individual parenting style. Raising a child truly takes a village. Strengths Based Parenting can help parents learn how to partner with teachers, coaches and other adults in their kids’ lives to create a positive, supportive environment to develop their talents into strengths and instill confidence. Mary Reckmeyer, Ph.D., is the Executive Director of Gallup’s Donald O. Clifton Child Development Center in Omaha, Nebraska. Under her leadership, the center has received national attention for excellence in early childhood education, workplace contribution and developmental results and has helped thousands of children build their lives around their strengths. The center has served as a model for schools nationwide and as a training center for teacher development and education. Reckmeyer has been with Gallup for more than 30 years. She has served as an Educational and Strengths-Based Development Consultant and Seminar Leader; studied talent-based interviews of more than 2,000 individuals, including children, teachers and parents; and helped create the Clifton Youth StrengthsExplorer, an assessment designed to identify talent in young people. Reckmeyer also coauthored How Full Is Your Bucket? For Kids, based on the #1 New York Times bestseller How Full Is Your Bucket? Reckmeyer is a former teacher who holds degrees in education and educational psychology. Her research has included youth strengths development, parents of minority achieving students, learning disabilities, educational programming and lifespan development. She has studied outstanding schools and has conducted formal research into what makes an outstanding child care center. Reckmeyer and her husband live in Lincoln, Nebraska, and have four children.